Rhode Island Turnpike and Bridge Authority | SIGNET Electronic Systems, Inc. When it comes to securing the structures that allow safe travel in the coastal area of Rhode Island and its neighboring states—the Claiborne Pell Bridge and the Mount Hope Bridge—the Rhode Island Turnpike and Bridge Authority (RITBA) is only interested in state of the art technology. 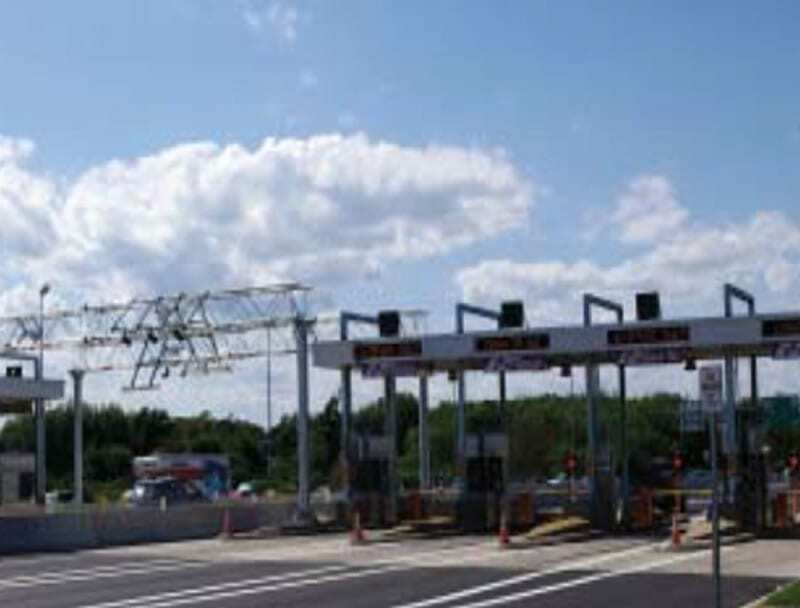 Subsequently, when RITBA recently constructed a brand new administration building to renovate their existing building, as well as renovate and upgrade the aging Bridge Toll booth/EZ pass lanes, they contracted SIGNET Electronic Systems, Inc., the leading systems integrator in New England, to design and install a multifaceted security solution. The contract, which was valued at approximately half a million dollars, was awarded to SIGNET based, in part, on the integrator’s continued relationship with the prominent electrical contractor, RF Audet Electrical Services. SIGNET’s scope was turnkey, including the design, furnishing, installation, commissioning, owner training and warranty of the integrated technology systems throughout the new facility, toll lanes and underground passage tunnel. The systems included integrated IP Video Surveillance, Access Control, Audio Visual Systems, Public Address, Intercom, a dedicated IP Network and structured cabling for the building, toll lanes, maintenance garage and tunnel. The client’s requirement for highly detailed images of rapidly moving vehicles, as well as their need to display video on multiple displays simultaneously, presented some of the unique challenges of this project. As of August 2012, SIGNET successfully deployed the comprehensive security solution. To meet the client’s requirements for highly detailed images of rapidly moving vehicles, SIGNET installed over 42 high speed super high resolution video surveillance cameras for each lane, allowing RITBA administrators to view toll collection booths and vehicle lanes and to easily identify license plate information. To facilitate color clarity, high intensity LED White Light illuminators were also installed externally to assist with nighttime and low-light level surveillance. In response to the client’s need to display video on multiple displays simultaneously, SIGNET installed three large LCD displays, an HD projector with dynamic quad window ability, one interactive whiteboard and a wireless touch panel control system for RITBA’s Emergency Operations Center. The AV systems also included rack-mounted computers to provide live video feeds of local and external systems for display in the Emergency Operations Center. Other installations which added to the complexity of the project included Access Control on 12 doors, and structured cabling consisting of 100 data work-area outlets, 40,000 feet of Category 6 cabling, and 1,000 feet of 10G optimized fiber optic cabling. The systems were extended to support the client’s renovated maintenance building, as well as their newly constructed employee-passage tunnel crossing underneath the highway. The products deployed on this system were based upon SIGNET’s best-in-class partner manufacturers comprised of Zenitel, Genetec, Hirsch, Crestron, Biamp, JBL, Axis, Dell, HP, Middle Atlantic, Hubbell, and Superior Essex. The successful design and implementation of RITBA’s robust systems integration project was an exciting opportunity for SIGNET as it allowed them to further cultivate their reputation for providing cutting-edge technology and customer service to the government sector. SIGNET’s expertise in this market thrusts them to the security forefront as more communities seek to secure their infrastructures.